Cojones de Caballo is a medicinal plant found in many parts of Mexico and Central America, especially in pastures, forests, and the verge of forests. 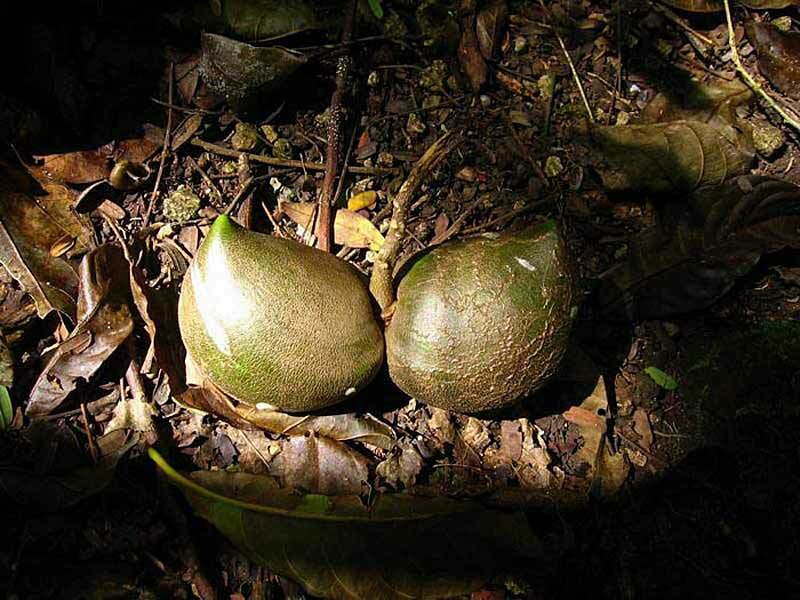 The name of this plant derives from the shape of the fruit which resembles...horse balls. The growth of this plant depends on habitat conditions and, if treated fairly, it can grow up to 66 feet in height. Cojones de Caballo are often surrounded by yellow-coloured plants and enfolded in a brown husk that takes up the majority of its weight. On the inside of the fruit, you can find the aril—the outgrowth of the seed. As a medicine, Belizeans primarily use Cojones de Caballo to get rid of beef worms, also known as botflies—internal parasites transferred by means of a mosquito. The sap of this plant cuts off the oxygen for the beef worm and works as an adhesive. When removed, the worm will be stuck to it and eventually die. Eww. Naturally, the fruits and branches of this specie secrete a thick, white substance that can be made into an uncommon form of latex, or glue. 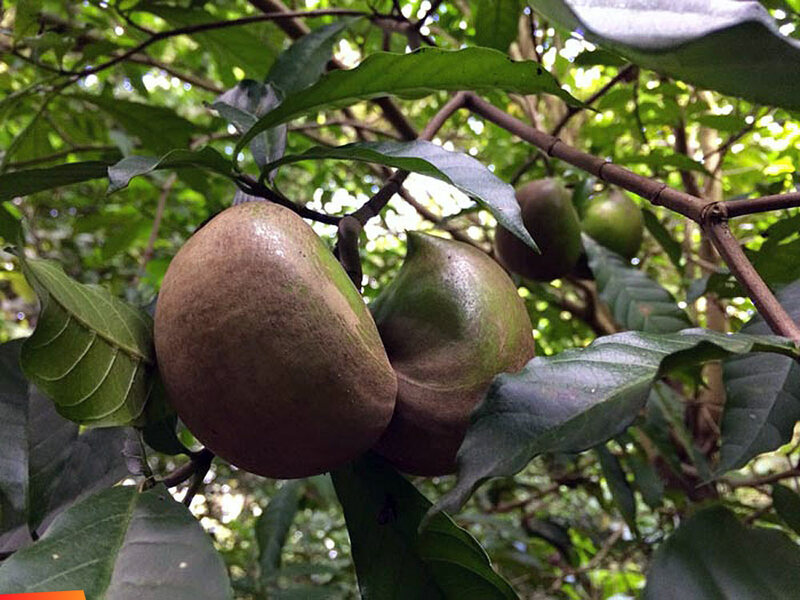 These are paired fruits on a mostly dry-season-leafless tree about 15 feet tall (5m). 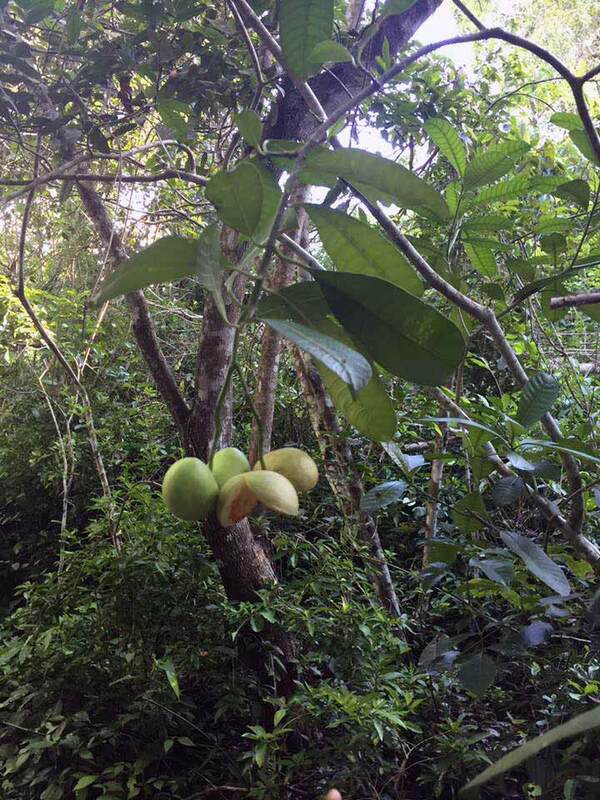 I was especially glad to see these fruits because back in the mid-1970s when I served as a naturalist on Maya-ruin-visiting boat trips in Guatemala's Petén Department -- just across the Usumacinta River from where I now was in Chiapas's Lacandon Reserve -- this little tree was one of the few I could identify for the tourists. And that was because of the fruits, which are about the size of eggs. In fact, the name the backcountry Guatemalans taught me for the tree was Huevo de Caballo, translating literally to "Horse Eggs," though everyone knew to translate "eggs" to "testicles." Sometimes the tree also is called Cojones de Burro, but that just means Burro Balls, the same thing, and also there's Cojón de Gato (Cat Balls). People here just can't look at the tree without thinking "testicles." Furthermore, in this culture men don't have balls; they have eggs, and the concept is so pervasive and potent that the polite shopper doesn't walk into a shop and ask for huevos, the dictionary definition for eggs, but for blanquillos, meaning "little white things." 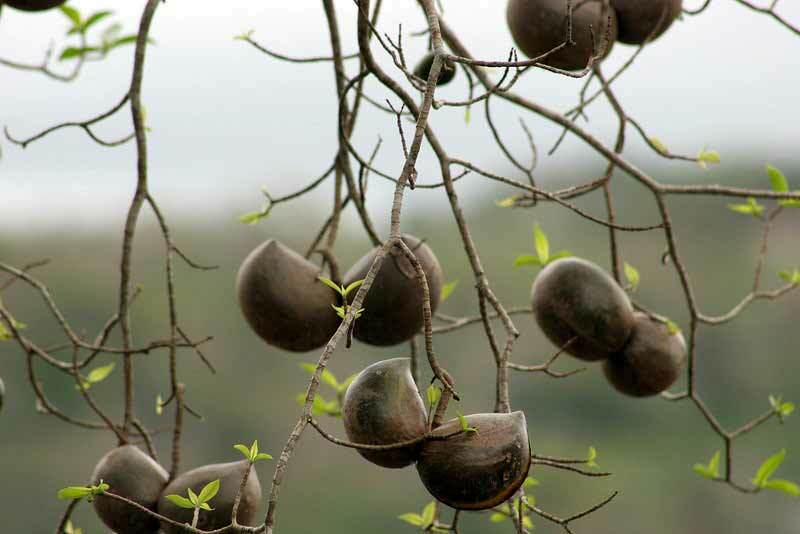 When you have paired capsular fruits like those in our picture, the first plant family to come to mind is the big Dogbane or Hemp Family, the Apocynaceae, and that's where the Horse Balls tree resides. It's STEMMADENIA DONNELL-SMITHII, found from southern Mexico and Belize south to Panama. The Dogbane Family is a big one, and one feature many of its species have is that they're filled with milky white latex. Most plants exuding white latex traditionally are considered medicinal and/or poisonous, and that's the case with Stemmadenia donnell-smithii. The latex has been used to reduce swellings, cure external tumors, and in neighboring Quintana Roo people have been seen daubing the white latex over the breathing holes of parasites that burrow into the skin, suffocating them and making them easier to expel. 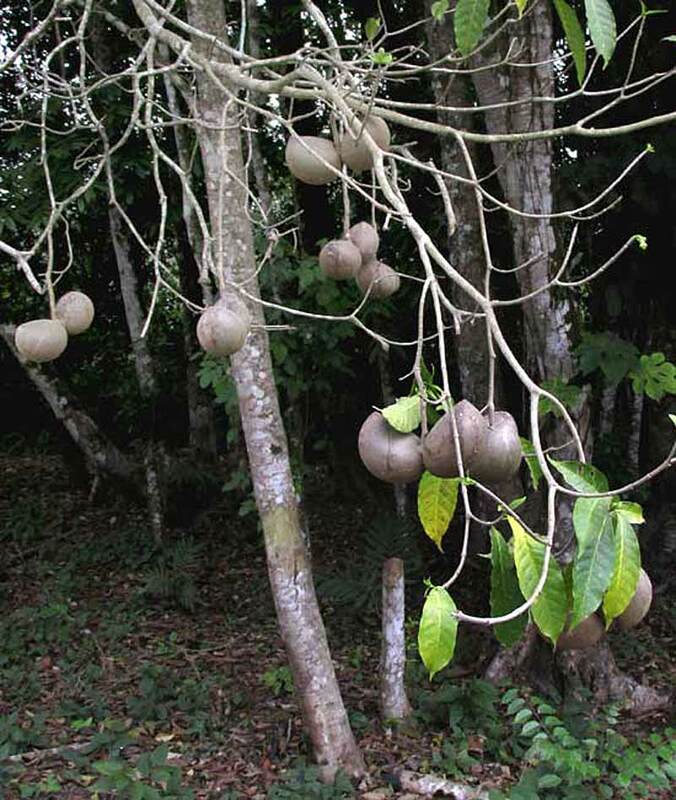 Chemically, the tree's latex has been shown to contain a number of powerful alkaloids.